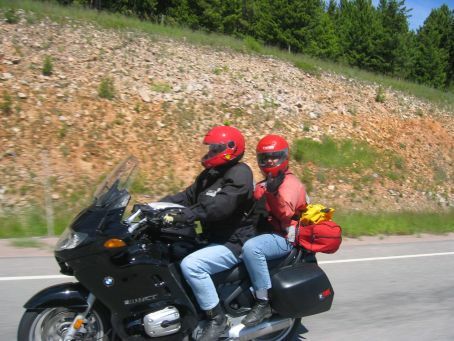 Riding 2 Up or pillion riding, or riding two up on a motorcycle: What you need to know to be safe. Prior to a vacation in Idaho last year, when I experienced mechanical breakdowns on two separate occasions, I had never really ridden on the back of the motorcycle. Oh, I would ride on the back on the way to dinner, and then back to the hotel - because I wanted to have a glass of wine. But, I had no experience in riding on the back of a motorcycle for a ride, for a day - through curves and twisty roads. When I had a flat tire that was not easily repaired, and then when I lost a cylinder, we had no choice. 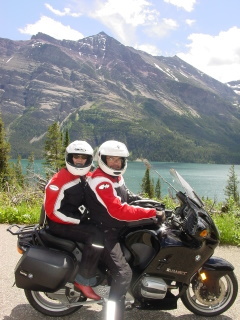 We had to have my motorcycle fixed, had to leave it overnight - so, we had to ride 2 up. I knew that Bob was not thrilled. After all, I first learned how to ride my own motorcycle because he didn't really want me on the back. 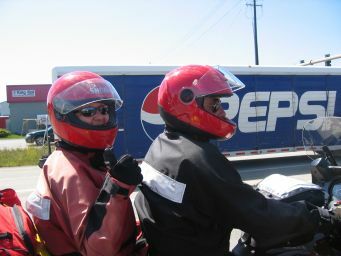 So, we learned how to ride as an unit - two people on one motorcycle - both people totally "control freaks." We managed. AND I learned what to do, and what not to do, while riding on the back of a motorcycle. Not a tough proposition. Let the person operating the motorcycle do the driving. Not so easy when you, the person on the back, also knows how to ride. If you are going to ride 2 up, you need to put your trust in the driver, and let him drive. 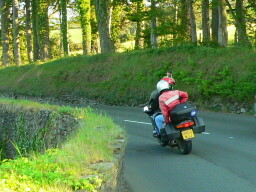 As a motorcycle rider, you need to be able to react quickly, and appropriately to what you see ahead. As the rider on the back, your field of vision is different. Don't be a back seat rider, constantly advising the driver to watch out for this or that. You are a passenger, not a rider. This was a bit hard for me to accept. It took a while for me to relax, and just enjoy the scenery. After all, I've always felt that I was a bit more proficient in the curves. But, the fact is: Pillion riding is not for the mindless. You need to be as aware as the operator. You need to be aware of your surroundings, and you need to be able to move with the motorcycle - you need to lean in with the curves, and move down on the straight-aways. You need to become one with the motorcycle, just like when driving the bike. If you've visited her-motorcycle.com before, you won't be surprised to know that I've put together some tips for riding 2 up on the back of a motorcycle safely. This tips were given to me from operators, who often ride 2 up. There are some additional tips from me, a rider who learned how to be a passenger. Either way, I think each tip is an important safety measure if you intend to ride 2 up on the back of a motorcycle. Do not make any noises or movements which are intended to startle the operator. Pay attention, and lean with the motorcycle. Don't try to yell at the operator while riding. Don't try to point out things on the side of the road to the operator. If you need to communicate, wait until there is a safe stopping point, or have a code for communicating. Wait to get on, and get off the motorcycle until the operator has a firm standing on the ground. Don't panic, you really have NO control over the motorcycle, but you can contribute to a loss of control. Don't ride on the back of a motorcycle if you don't trust the operator. Don't ride on the back of a motorcycle with an impaired operator. Don't sleep while a passenger on a motorcycle. You will become dead weight, and more likely to be unstable. If you want to have the ability to communicate with each other while riding 2 up, there are various communicator systems that you can hook up to your helmets. You can also develop a system of communicating short of a formal walkie-talkie, where both of you can enjoy the experience, cleanse your soul, and enjoy the ride! 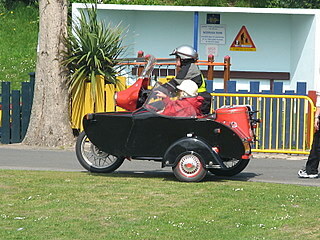 Do You Have a Memorable Experience Riding 2 Up? Click below to see contributions from other readers of this page. Back to when "Hell Freezes over"